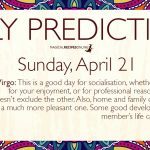 General Daily Predictions: Today, the Moon from Sagittarius conjuncts Jupiter, there. Then, from Capricorn it forms a triangle with Uranus, in Taurus, and a hexagon with Venus, in Pisces. Also, from 2:37UT until 14:07UT, the Moon will be void of course. Also today, Venus hexagon with Uranus becomes accurate. So, this is going to be a good day. The long void of course Moon period can cause some issues in new deals, new beginnings and the like, but, other than those, things are good. 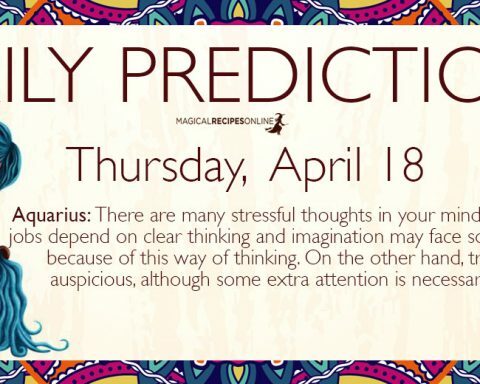 The almost stationary Mercury can add some stress in to the same subjects, too. Sagittarius, Capricorn , Pisces and Taurus Cancer will be the luckiest zodiacs of the day. Work receives beneficial influences, in all aspects of it, including income and career decisions and changes. For the latter, though, it would be wiser to act upon those after the end of the void of course Moon period, whenever this is possible. This can be quite a healing day for you, especially so for internal and emotional healing. Some kind of success can also come, especially regarding your projects and plans, as well as your social life. Love receives some good luck, including finding a new love. Also, work and business receives quite beneficial influences. Furthermore, your spiritual and magical powers are quite active and effective, today. Work receives some boosting and some good luck, today. Trade of services, job applications and interviews, as well as work related seminars and the like receive even stronger beneficial influences. This is a mostly pleasant and happy day, in most aspects of it. Love, health and work, all receive some good influences. Also, it’s a very healing day, both literally and symbolically. Home and family can play a pleasant role in your day. Also, love seems to be quite happy and lucky. Travelling is quite auspicious, too, especially when it’s for pleasure rather than for work reasons. Money receives some good luck. Also, work seems quite productive. It can be quite busy, too. In some cases in unexpected ways, but with good results, nonetheless. Love and social life also seem to be a somewhat lucky and pleasant. Intuition can be quite helpful, today. Imagination, too, is quite creative. Therefore, whatever makes a use of it can advance significantly. Also, social life and love receive very supportive influences. Moon 19° Sagittarius 01' 10"
Venus 02° Aries 55' 56"